These four photographs are from a larger series on the moon, originally made by Rogers in 1991 but re-interpreted in 2016. All were made using 4" x 5" film on a copystand (rather than a conventional camera). In each, incongruous objects masquerade as the moon. The moon, it seems and Maybe the moon #2 depict segments of plaster models made by the artist that invoke the pockmarked topography of the moon’s surface. Whereas in Maybe the moon (blue moon) an orange becomes a lunar proxy. The Moon as Mould (perhaps) is a photograph of a section of unprocessed raw photographic paper left to rot and accrue mould over a period of months. 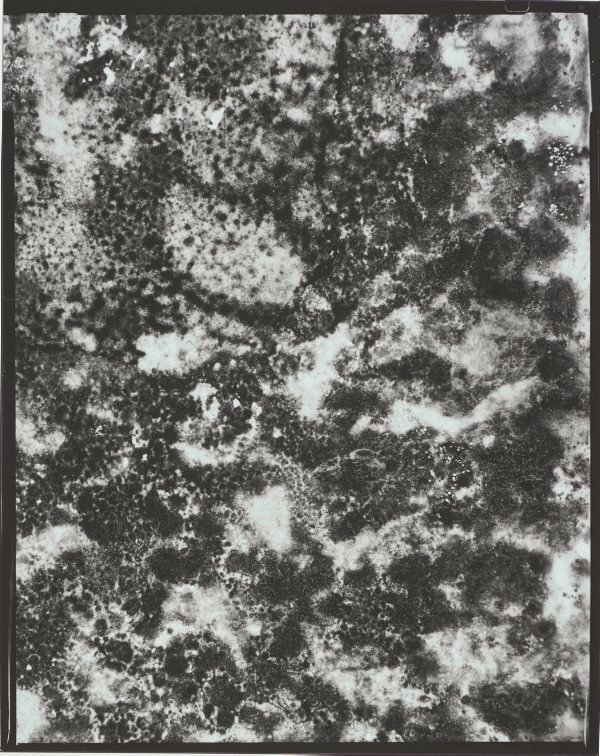 The decay resembles a grainy satellite photograph of the moon and here, in this study of photographic degradation, multiple modes of photography enter the frame.